Hopkins Clinic limits its practice to the examination, diagnosis and treatment of traumatically induced injuries related to motor vehicle collisions and other personal injuries resulting from incidents such as slip and falls, boating injuries, dog bites, and personal altercations. Hopkins Clinic’s advanced training & experience does make a difference. 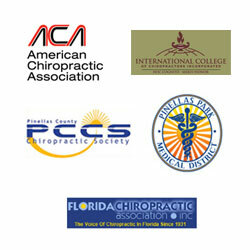 We are a distinctive and unparalleled health care facility serving the Tampa Bay Florida area. Dr. Clayton Hopkins has been helping patients since 1983. Thousands of patients suffering from neurological and musculoskeletal complaints have passed through the doors of Hopkins Clinic and found relief and an understanding team of caring professionals waiting to assist them. Dr. Daniel Roode, Dr. Margaux Allen and Physical Therapist Breck Pribyl also direct the Hopkins Clinic team that includes Licensed Massage Therapists, Registered Chiropractic Assistants and a Certified Personal Trainer. If you are in pain or just want to feel better, call us today. The highly trained professionals of Hopkins Clinic are focused toward the treatment of significant traumatically induced injuries, often the result of automobile collisions, work related accidents and sport injuries. Over 75% of our patients have sustained injuries to spinal intervertebral discs. Chiropractic is a health care profession that focuses on disorders of the musculoskeletal system and the nervous system, and the effects of these disorders on general health. Chiropractic care is used most often to treat neuro-musculo-skeletal complaints, including but not limited to back pain, neck pain, pain in the joints of the arms or legs, and headaches. Doctors of Chiropractic – often referred to as chiropractors or chiropractic physicians – practice a drug-free, hands-on approach to health care that includes patient examination, diagnosis and treatment. Chiropractors have broad diagnostic skills and are also trained to recommend therapeutic and rehabilitative exercises, as well as to provide nutritional, dietary and lifestyle counseling. The Clinic has developed a strong reputation in its friendly and caring treatment of traumatically induced injuries such as automobile accidents and work related injuries with a focus on a multifaceted approach of traditional medicine, chiropractic treatment and physical therapy rehabilitation. Physical therapy modalities as well as “hands on” therapy by specially trained Licensed Massage Therapists are utilized to provide quick pain relief and optimum recovery of soft tissue injuries. Hopkins Clinic emphasizes active exercise and rehabilitation as the cornerstone of your treatment plan. An experienced Physical Therapist will supervise your treatment program customized for your specific rehabilitation goals. Discover the benefits of a multidisciplinary approach and get the results that work for you. Hopkins Clinic… when nothing but the best will do! Acupuncture is a component of oriental medicine that involves the insertion of extremely thin needles in your skin at strategic points on your body. Acupuncture originated in China thousands of years ago, but its popularity has grown significantly within the United States. Hopkins Clinic is a leader in the Tampa Bay area in offering Spinal Decompression traction therapy. This FDA cleared treatment is performed on a newly designed computer program that provides gentle traction to the spinal segments, intervertebral discs and nerve roots to afford relief from this debilitating pain. Many patients, who have tried chiropractic care, physical therapy, drugs, injections, and even surgery without relief, have had success with this treatment. Combined with a rehabilitation exercise program and home instructions, relief may be in your near future. If you or someone you know has been in an automobile accident, there is no reason to suffer. The combined approach of hands on Chiropractic treatment and medical intervention can provide surprisingly quick relief. Remember, automobile insurance pays for your treatment for this type of painful injury. Don’t delay! The quicker you start your therapy, the sooner you will be feeling well again. Referrals for advanced diagnostic testing to include X-rays, nerve testing, ultrasound imaging, MRI, CT, and PET scans and bone density testing is easily and quickly arranged through the office. Your satisfaction is our highest priority. You can rest and relax knowing you are in good hands at Hopkins Clinic. Call (727) 544-3330 for an appointment. For a FREE no obligation consultation or for more information please contact Hopkins Clinic at 727-544-3330 today.